our post today is about something really major - we got chosen to be Luxola's Bloggers of the Month! :) This all happened thanks to my very dear friend, Emily! She introduced me to the founder of Luxola, Alexis, whom so generously offered us this opportunity on the spot! I was so excited I actually called Ashley up right after we spoke, and both of us just stayed on the phone gushing and screaming for a good 5 minutes, lol we are such girls really. I later got to discuss this collaboration with a few other Luxola ladies - Camille, Shaleniie (who we've been in touch with for quite awhile), and Martha. All of them were very sweet and so efficient, and everything got wrapped up within a few weeks. If you managed to guess, this was the reason we carried our photo shoot out! We wanted to look good for the banners, and we're so pleased with how everything turned out! The billboards look gorgeous, with such pretty layouts and fonts (yes graphic designer mode ON) and the colors just look magnificent! :) We feel so honored to be part of this! If any of you aren't aware of Luxola (AND WHY NOT!?!??! ), it's a company started by women for women! Go girl power! They know just what we NEED: affordable alternatives to the very expensive and boring options that Singapore offers. 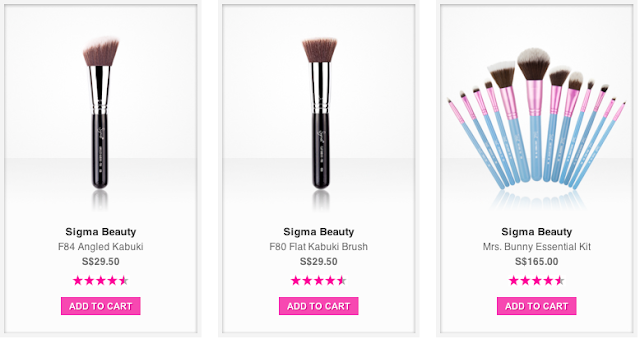 Instead of MAC brushes, I am given a choice to look at Sigma brushes. When I am broke and cannot afford a NARS blush, I can opt for a Sleek one! On top of that, they do home deliveries and accept Cash on Delivery! Too awesome. I do not have to trouble myself with leaving the house nor meddling with my IBanking device. All I have to do is open my door and wallet. So perfect for a sloth like me. Though their main focus is largely on Singapore, they do deliveries to many other parts of the world such as Hong Kong, Brunei, Malaysia, Indonesia and the Philippines! You can refer to their website for shipping rates. Ash and I talk about the products we love from Luxola, and we've actually written reviews for some of them like Smith's Rosebud Salve and Rachel K's CC Cream. 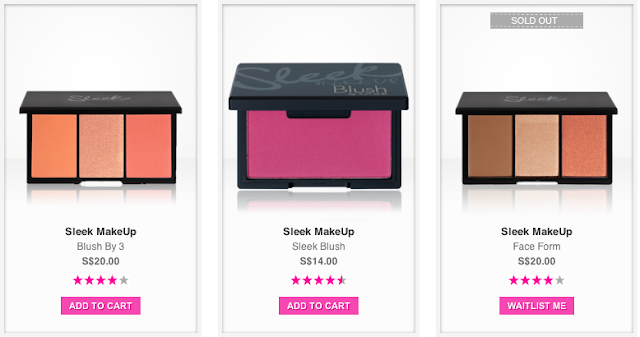 Others like the Beauty Blender and Silver Powder have made wonderful guest stars in our other posts as well. 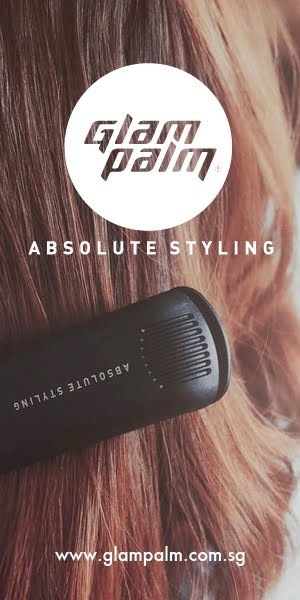 If you'd like us to review any other product that we've mentioned, feel free to comment! :) I'm definitely thinking of doing an in-depth post on the beauty product I CANNOT live without, my little Beauty Blender! Here's a small interview that we both did with Luxola, talking a little about our passions and ideas of beauty. It has been such a wonderful experience. 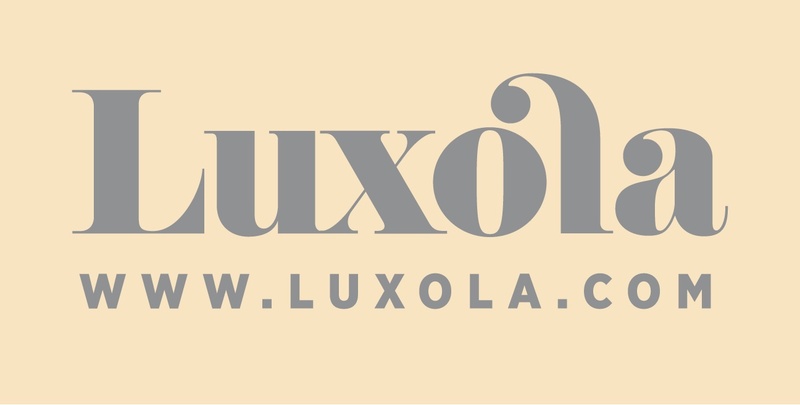 The people at Luxola are genuinely nice, and we're not saying this for the sake of the article. As you know, we're such a small blog, and yet they put their vote of confidence in us by featuring us on their website and Facebook to their many fans. We're grateful beyond words. 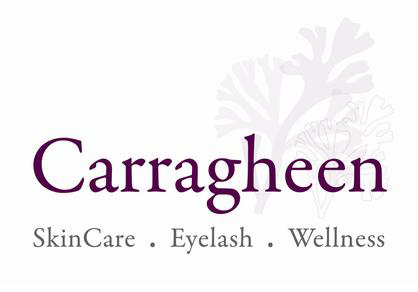 Do check their website out (you can click the advert at the end of our sidebar to redirect) for wonderful skincare and makeup finds such as Mario Badescu, Sigma, Rachel K, Becca, Edward Bess, The Konjac Sponge Company, and many more. I have *guiltily* spent hours poring over their stuff deciding just how many things I could buy without my boyfriend finding out and killing me, haha! On a side note: we want to thank all our readers for their undying support as well, especially those who have been reading from Day One. All of you give us the strength to work harder and better all the time! So much love for all of you. You folks are doing beautiful work! Not too long now before the brand reps of the top beauty brands come knocking. Thanks for your support; yes it's been an amazing journey filled with wondrous opportunities. We've been very lucky all our hard work has paid off. both of you did well! i love the beauty blender as well! Lovely blog ladies! I enjoy reading your beauty thoughts and reviews. Please check out my site www.ShopVenture.com which is home to online shopping reviews on fashion, beauty and lifestyle online stores!